The woman shouted “Allahu Akbar” at the moment of the attack, according to an AFP reporter who spoke with witnesses: She could have a mental disorder, according to the prosecutor. However, police have not ruled out the possibility that the woman had been radicalised. A 37-year-old man also suffered severe head trauma in the second incident with “potentially life-threatening injuries,” police said, adding that the victim remains in critical condition: The suspect, identified as Jacob Anthony Smith, a 28-year-old transient, was booked on suspicion of attempted murder. His bail was set at $500,000. Police described the attacks as random and do not believe any suspects are outstanding. Police have not released what kind of weapon was used in the incidents………Anyone who witnessed either of the attacks can call Crime Stoppers at 855-TIP-OCCS or email http://www.occrimestoppers.org. In an interview with Radio24syv, el-Ali claimed to be suffering from remorse and asked for an opportunity to return via Turkey: “I have talked to the Danish authorities about returning home; I have called the Danish police. I have talked to my lawyer about it; I have called the Danish embassy and there is not really anyone who will help. What they actually say to us is that we just have to stay here and die,” el-Ali said about himself and fellow Danish jihadis. The case of Jacob el-Ali is the second of its kind over a short period of time. Last week it was established that Ahmed el-Haj, a 26-year-old Danish citizen, who previously appeared in an Islamist video featuring portraits of former Prime Minister and NATO Secretary General Anders Fogh Rasmussen and Conservative politician Naser Khader shot as “enemies of Islam,” has signaled his desire to return home from a Turkish prison. “I do not understand why we need resources to pick up a national traitor and expose ourselves to a risk of future terrorist attacks,” Khader wrote. In recent years, Denmark has contributed to the jihadist cause with around 150 “foreign fighters.” Previously, Copenhagen had made it clear that these “foreign fighters” are not welcome back in Denmark and even tried revoking their citizenship. Ukrainian Interior Ministry board member Anton Gerashchenko confirmed that Babchenko had been shot several times in the back in a stairway and died of those wounds. “The killer was waiting for him on the stairwell at the entrance. When Arkady opened the door to his the apartment, the murderer made several shots in the back of Arkady Babchenko,” Gerashchenko wrote in his Facebook blog. Ukrainian police circulated the Babchenko killer’s suspect sketch showing 40-45 y.o. man with grey beard. The head of Russia’s Human Rights Council said the council condemns the murder and will demand that Kiev conduct a thorough investigation. Russia’s Investigative Committee has also launched an investigation. Meanwhile, the Committee to Protect Journalists urged a swift and thorough investigation into the murder. 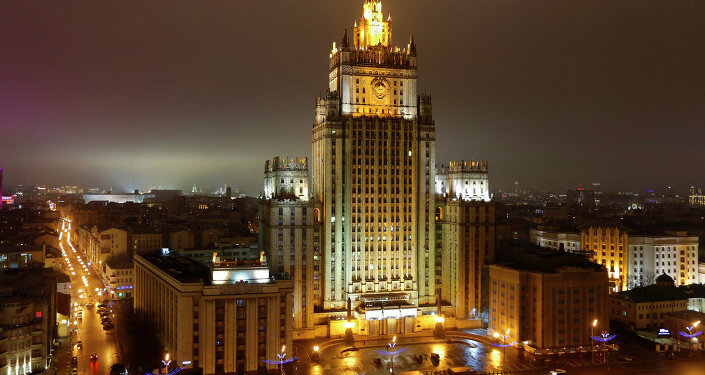 The Russian Foreign Ministry said that Moscow was demanding that Kiev conducted a swift investigation of the murder of the journalist. “We are demanding that the Ukrainian authorities do everything possible to conduct the investigation swiftly,” the ministry said in a statement published on Facebook. Moscow urged the relevant international organizations and non-governmental organizations to control the probe as well. The foreign ministry also noted that media professionals in Ukraine were more and more often facing physical violence or murder threats, but probes never seem to lead to the punishment of the culprits. In 2016, journalist Pavel Sheremet died when a car he was driving blew up in downtown Kiev. Ukrainian Interior Ministry said the explosion was probably caused by a remote-controlled explosive device. The Russian Foreign Ministry stated back then that Russia was shocked by the murder and hoped that the chain of impunity in killings would be interrupted, recalling the 2000 killing of journalist Georgy Gongadze, the April 2015 shooting death of Oles Buzina, and the deaths of journalists in conflict zones across eastern Ukraine. North Carolina Gov. Roy Cooper said the two died due to storm-related conditions. “North Carolina needs to take Alberto seriously,” Cooper said in a news release: Alberto also disrupted Memorial Day plans in Alabama, Florida and Mississippi as it moved into the Southeast. Instagram user Melody Kay Carroll posted a video clip of wind and rain in a Panama City parking deck. “Strong squalls off and on” had kept her inside, she said. The heaviest rain bands and strongest winds began coming ashore around 10 a.m. Monday in Panama City Beach. A Tropical Storm Warning is in effect for the northern Gulf Coast from the Aucilla River west to the Okaloosa/Walton County line, the National Hurricane Center said in its 8 p.m. ET update. The three states likely to bear the brunt of the storm have been preparing states of emergency. Florida Gov. Rick Scott issued a declaration for all 67 counties in his state. Mississippi Gov. Phil Bryant authorized the use of the National Guard, his office said. The storm’s center is expected to move over Alabama on Monday night and Tuesday, the NHC said. The forecast projects the system moving over the Tennessee Valley on Tuesday and into the Ohio Valley and Great Lakes region on Wednesday and Thursday, the center said. 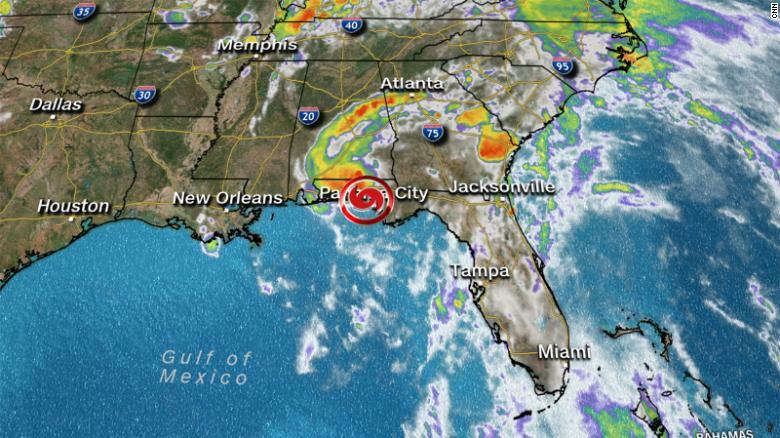 Alberto could bring isolated storm totals up to 12 inches in areas of the Florida Panhandle into much of Alabama and western Georgia through Tuesday, the NHC said. The Florida Keys and Florida peninsula could receive up to 5 inches of rain in some areas. “Heavy rainfall will lead to a significant risk of flash flooding across the Florida Panhandle, much of Alabama, and western Georgia through tonight, spreading northward into northern Georgia, the western Carolinas, and Tennessee on Tuesday,” the NHC said. The National Weather Service said 2 to 6 inches of rain are expected in the rest of the Southeast and the Tennessee Valley into the lower mid-Atlantic from Tennessee east through the Carolinas. “The combination of storm surge and the tide will cause normally dry areas near the coast to be flooded by rising waters moving inland from the shoreline,” the NHC said, with water potentially reaching 1 to 3 feet above ground if the peak surge occurs during high tide. 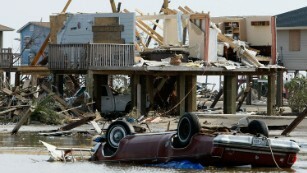 Isolated tornadoes are likely through Monday night in parts of Georgia and southeastern Alabama, the NHC said. “Alberto will likely become a subtropical depression tonight or early Tuesday and degenerate into a remnant low by Tuesday afternoon,” the NHC said. Authorities in New Orleans urged residents and businesses to “get prepared and stay informed” about the storm. The main threat is from heavy rain that could lead to flooding, the city said, but also high winds and storm surge could cause problems. Hurricane season doesn’t officially begin until June 1, but Alberto apparently missed the memo. 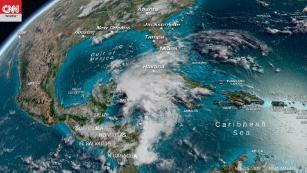 The tropical system became a subtropical storm Friday, the National Hurricane Center said. The early storm doesn’t necessarily mean this year’s hurricane season will be as busy as last year’s, though. The season is likely to be “near or above normal,” according to the NHC. CNN’s Taylor Ward and Janet DiGiacomo contributed to this report. National security adviser John Bolton — an Iran hawk who nonetheless told people he was committed to providing all options to Trump — offered a variety of paths, including reimposing all sanctions, applying new sanctions or allowing for more time to negotiate with the Europeans. Trump determined that more time would not bridge disagreements, most pointedly his demand that Iran’s nuclear program be curbed past the current deal’s sunset. In his talks with Macron and Merkel, Trump left little doubt that he was planning to withdraw, according to Western diplomats. But he insisted he hadn’t made a final decision and kept his plans very close to the vest in the lead-up to today’s announcement. We’re waiting for President Trump’s 2 p.m. ET announcement on the Iran deal. Vice President Pence is notifying Hill leaders that Trump will withdraw from it, a congressional source says.